i was so super excited when i read the description of this book. i knew straight away that it was one i just had to read. having two teenage littles of my own, i crave being a prayer warrior mama. Today's Christian moms want to be prayer warriors, standing in the gap for their kids. But many mothers haven't been equipped with the prayer skills, scriptural knowledge, and practical strategies needed to fight the spiritual battle. "The only real power we have on earth is the power of prayer. Our potent prayers for our kids connect them with the reality of God and His will for their lives," Marla says. this book was absolutely amazing and not only met but exceeded, far exceeded, all my expectations of it. i am a self-proclaimed "bad prayer". i know there isn't such a thing, but i've always felt like one. i know that God knows my heart and he hears my prayers before they even leave my lips. i just feel like a times i stumble through them, not quite knowing what to say. this book has helped me more than i could have ever dreamed. what is a prayer warrior mom? being a prayer warrior mom means we release control to our Father and trust Him with every aspect of our children's lives and well being. that means giving Him our children's future, even though our dreams for our kids might not align with His plan for them. God longs to honor our prayers for our kids, isn't that sooo comforting? each chapter beings with an encouraging quote then dives into the subject. it ends with a prayer, a few Bible verses relevant to the chapter (call the Sword of the Spirit) and small group discussion questions. this book could oh-so-easily be used for a ladies Bible study or a moms group. and the discussion questions would prompt some amazing, helpful discussions. 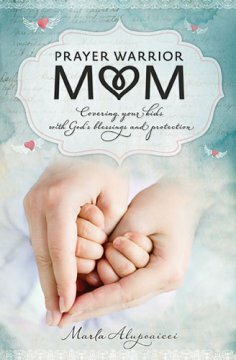 i would recommend this book to every single mom. all of ya'all, whether you are an experienced prayer veteran or new to the program. this book will walk you through, step-by-step, how to stand in the gap for your children. it's an extremely well written book that was a joy to read, from front to back.